Chemical weathering is among the most important geochemical processes operating on Earth’s surface, driving the cycling of elements from continents to sedimentary basins and consequently modulating the composition of the crust. Most importantly, chemical weathering of silicate rocks, i.e. silicate weathering, represents a major sink to atmospheric CO2 over geological timescales, regulating the geological carbon cycle and the long-term evolution of the climate system. The rate and intensity of silicate weathering require accurate and precise quantification in order to evaluate the efficiency of neutralizing capacity of CO2 by silicate weathering. Due to its low concentration in carbonates and its large mass difference between 6Li and 7Li, Li isotopes are considered as the most promising tracer of silicate weathering processes currently available. There was a ~10‰ difference of Li isotopic compositions at the same site in different seasons. Some studies explored δ7Li signatures through collecting time-series samples at regional and catchment scales and showed differing, location-specific, seasonal variations of δ7Li.However, most time-series data do not have high-enough resolution to decipher the role of climate and extreme hydrological events (e.g. storms) in Li isotopic fractionation, and to eliminate the associated uncertainties. Therefore, further studies with samples collected at higher temporal resolution are required to better understand the responses of δ7Li to changes in climatic and hydrological conditions. The research group led by Prof. JIN Zhangdong from Institute of Earth Environment(IEE), Chinese Academy of Sciences collected high-resolution samples in the middle reaches of the Yellow River (Fig. 1), elucidated the significance and utility of riverine Li isotopic fractionation in the context of conservative mixing and related weathering processes, and conducted a comprehensive investigation on how riverine δ7Li was affected by water sources and weathering processes in semi-arid regions, and how and why weathering processes varied over a hydrological year. The results showed that the dissolved Li was mainly derived from silicates and evaporites in the arid to semi-arid Yellow River basin. 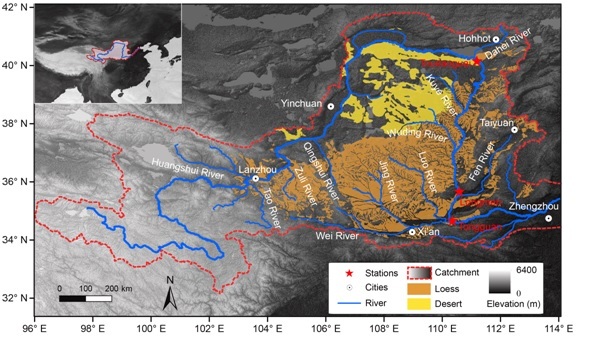 Silicate weathering of loess during the monsoonal season dominated the Li flux in the middle reaches of the Yellow River, with a positive relationship between dissolved Li flux and physical erosion rate. Evaporite contribution for riverine Li was relatively constant in the middle reaches of the Yellow River but slightly increased after the storm event, with an average proportion of ~25%, which might represent the proportion of evaporite contribution to global oceans. 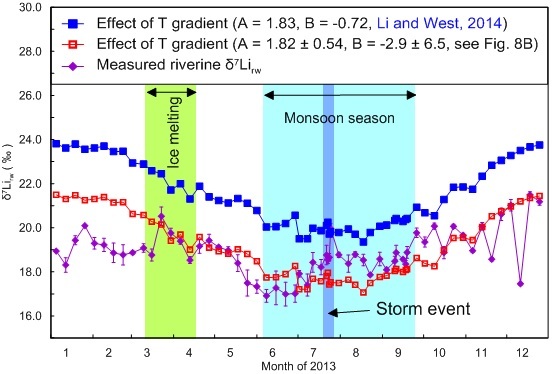 Seasonal variations in the riverine Li isotopic compositions were dominantly controlled by temperature with a fractionation gradient as -0.182‰ per ℃ over the full year with deviations likely driven by re-dissolution of suspended particulate matter, extreme hydrological events, and groundwater contribution (Fig. 2). Temperature dependent δ7Li value variation of river water inputted into oceans indicated that Cenozoic climate cooling itself may be able to explain ~2‰ of the 9‰ rise of Cenozoic seawater δ7Li value. The seasonal variation in riverine Li isotopes highlighted that erosion and weathering of loess may provide valuable clues on secular chemical weathering and seawater δ7Li variation spanning a range of time scales. This work presented the first temperature-dependent seasonal δ7Li on the continental scale to better understanding Cenozoic Li isotopic evolution and qualified evaporates contribution of Li flux continents to oceans. This work has been published on Geochemica et Cosmochimica Acta. This work was financially supported by the Key Research Program of the CAS, the NSFC Program, and ERC Consolidator grant. Fig.2 The suspend particulate matter (SPM) concentrations of the Toudaoguai (TDG) and Longmen (LM) hydrological stations over 2013, showing that SPM was mainly derived from loess between TDG and LM during the monsoon season.